In the middle of making a new film about birds of paradise, David Attenborough talks to Chris Watson about his sound recording escapades across his 60-year career. One of Sir David's first jobs in natural history film making was as a wildlife sound recordist. 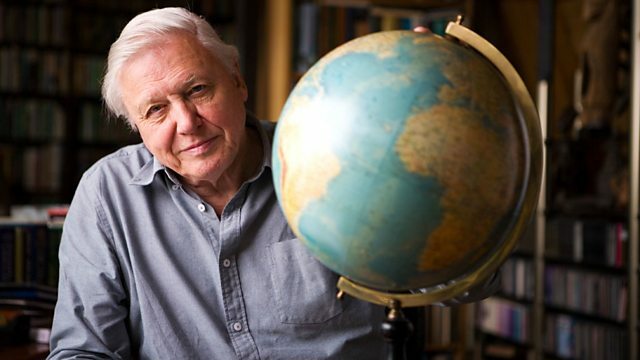 Recorded in Qatar, David Attenborough is with wildlife sound recordist Chris Watson, there to make a film about a group of birds he is passionate about, The Bird of Paradise. It is in Qatar where the worlds largest captive breeding population is and it is in this setting Chris Watson takes Sir David back to the 1950's and his early recording escapades, right through to today where David Attenborough narrates a series of Tweet of the Day's on Radio 4 across the Christmas and New Year period. British birds through their songs and calls. 265 programmes of 90 seconds, over a year. "I took a lot of trouble to record music"
“Back in ’54, I wanted to make some films in Africa…"
Picture of David Attenborough recording frog chorus with an L2 EMI recorder. Image courtesy of David Attenborough. David Attenborough crouched down next to a parabolic reflector and recording equipment, with cameraman Charles Lagus - both primed ready to catch the object of their attention. Image courtesy of David Attenborough. Sir Peter Scott founded the Severn Wildfowl Trust (later Wildfowl & Wetlands Trust - WWT) in 1946. He was also a founder and the first chairman of the World Wildlife Fund (WWF) in 1961, and founder of many local and regional bodies from the Gloucestershire Trust for Nature Conservation to Falkland Conservation. This picture was taken in May 1962. Image courtesy of David Attenborough. Sir David Attenborough with Sir Peter Scott looking out over one of the lakes at WWT Slimbridge in May 1962. Radio Times article about Chris Watson recording a solitary ant. Wildlife sound recordist Chris Watson, is always searching for new and innovative ways to record sound. A Radio Times online article published in Febuary 2013 explored Chris' remarkable insight into sound recording; including the capture of the sound of a solitary ant. The article also has some exclusive audio clips and his feelings about music in wildlife shows. This programme will be available to download for free on Friday 20th December 2013 via the Radio 4 Documentary of the week podcast page. A pocketful of captivating sounds collected from science, nature and everyday life.